Now, that I feel somewhat confident with the medium, I have decided to begin my Shore Line Series. My goal is to create 10 encaustic artworks of our shoreline around the lake where I have my studio. I have tried different techniques over the past month and have concluded that the paint needs to be added to the surface similar to a pointillism technique. Through experimentation, overlapping small brushstrokes and a layering of different colored oil paint/wax are needed. Then over the waxed surface use an iron and blend very carefully. The problem with the iron – too much wax could be melted in areas and the edge of the iron can leave grooves that expose the back water colour paper layer. This can be used to my advantage as well if the bottom layer coming through the surface is exposed. I have to plan the layers of colors so that one can see the bottom layer and it is integrated into the foreground. In the first 12 “ X 12” shoreline work I used my imagination and first created a water surface treatment with the layering of colored wax and then took may iron to incise the surface into a waving pattern to represent the water. Then, I took strips of fabric and waxed them down to the surface. The fabric represented the reeds. 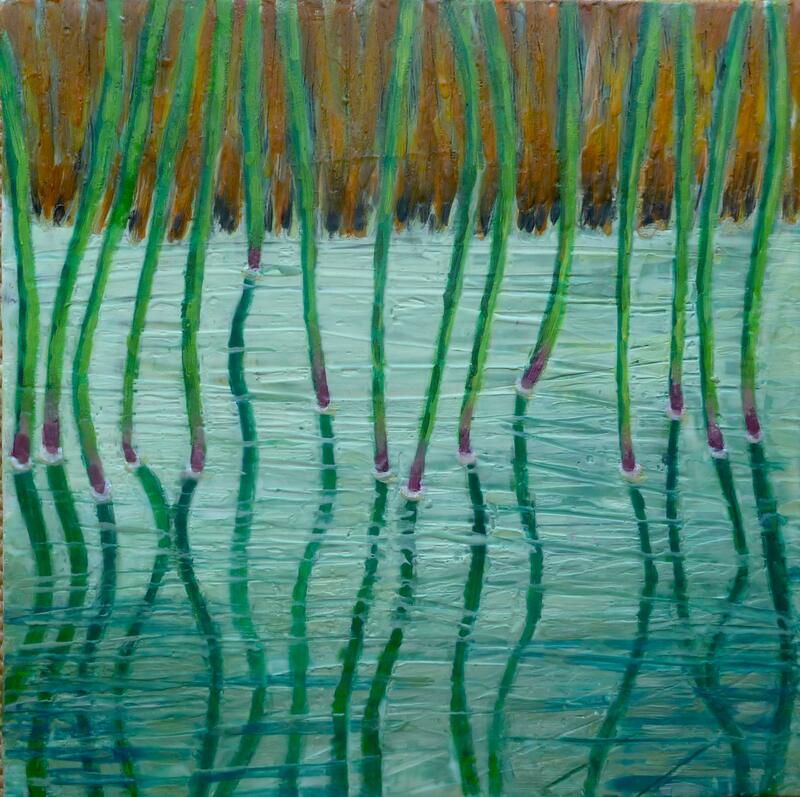 I added a bit of dark color to the edge of the reeds to suggestion a light source. The following image is my first attempt at water.